It’s really not fair for me to rate The Grapes of Wrath as a film considering John Steinbeck is one of my favorite writers and the novel is an American classic. Director John Ford never had a chance articulating this incredible novel in a two hour movie. The novel has so much depth and so many layers that the film couldn’t touch, and of course the film barely scratches the surface of those themes. The novel, of course, ends in shocking fashion with Rose of Sharon feeding a starving man from her breast and Ford was just not going to touch that with a ten foot pole in 1940. Additionally, former pastor Casy is a key character in the novel and he hardly plays a part in the film. Casy is the spiritual center of the novel and it is he who provides Tom Joad with inspiration to fight for justice. That said, I guess I’ll say a few good things about the film. The film was made not long after the fictional events of the Joad family would have taken place, and given that it was pretty bold of Ford to adapt Steinbeck’s novel for mass audiences. The dust bowl and depression was an horrific time in American history and one of the most important aspects of art is that it can provide people with a way to look at their own situations and the situations of those around them. For that reason the film is important and even though it doesn’t do the novel justice it still does a good job portraying life for the folks who were run off their land during the dust bowl and the difficulties they found out West. Beyond the story there are some great acting performances, most especially that of Henry Fonda who was nominated for a Best Actor Oscar but lost to James Stewart for The Philadelphia Story and for the record that is one of my favorite films and it is by far Stewart’s best performance so I’m not going to complain about Fonda losing. 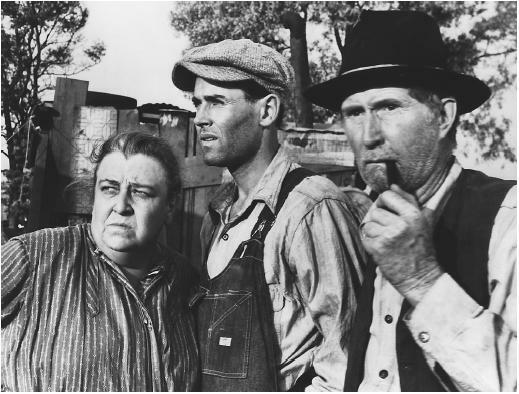 Jane Darwell actually did win an Oscar for playing Ma Joad and she was definitely a highlight in the film. She keeps the family together through difficult times and Darwell is terrific. She is a great actress who also had key roles in Gone With the Wind and Mary Poppins to name a couple.